Get Your Free Scholarship Coach Ebook! Looking for college scholarships? The latest Scholarship Coach has you covered, no matter what your major. 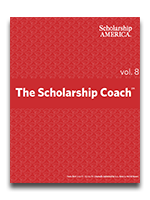 To make sure the high cost of college doesn't keep students from earning their degrees, we're happy to bring you the latest free ebook in our Scholarship Coach series.This free e-book features more than 50 pages of highlights, tips and tricks for scholarship seekers in high school and college!